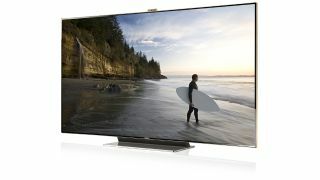 Announced earlier this summer for US and Korean markets, Samsung has done the decent thing and rolled out the exotic 75-inch Samsung ES9000 LED Smart TV to Europe at IFA 2012. UK pricing for the massive 75-inch model will be around the £8,000 mark; so, just what do you get for you money (apart from the minor matter of more than six feet of screen diagonal, that is)? The luxury list kicks off with what Samsung describes as a beautiful rose-gold finish and a super-slim 7.9mm bezel with no visible seams. Next up is an integrated webcam located at the top of the screen which slides out of view when not in use. Classy. As the name suggests, you get all the latest Samsung Smart TV features, too. So that's Smart Interaction, Smart Content, Smart Evolution – smart, everything really. Did we say how smart it is? Wondering what that actually means? How about both voice and gesture controls along with sharing media across multiple devices. Then there's internet access in various flavours and app support, including the now obligatory Angry Birds, which just so happens to be playable with gesture controls. Take that, Xbox 360! As for more detailed specifications, Samsung is keeping schtum for now, sadly. Meanwhile, if the Samsung ES9000 LED Smart TV is just a little too rich for your tastes, there's a marginally more affordable Samsung ES8000 LED Smart TV, the screen of which measures a piffling 65-inches.